Lonovo Z6 Pro will be launch launched March 27 as recently confirmed by Lenovo Group’s Vice President Chang Chengfa. Chang has now shared a new teaser poster of its upcoming Lenovo Z6 Pro on his official Weibo account. Chang post revealed that the Lenovo Z6 Pro will have “100 million pixels”. The post suggests that the upcoming Lenovo Z6 will be powered a by HyperVision camera with a 100-megapixel sensor. 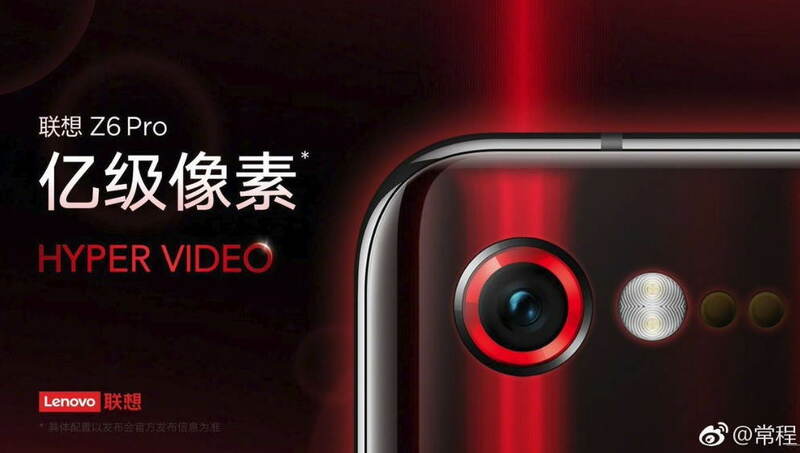 Various videos are also being circulated on the internet, that teases the Lenovo Z6 Pro’s HyperVision Camera or the ‘Hyper Video’. Chang also shared the teaser video that shows the Lenovo Z6 Pro Hyper Video, Super Macro sample video shot. You can watch the video below. There isn’t much information available for now on the upcoming device and its other camera features. iThome report suggests that the Lenovo Z6 Pro might come with an in-display fingerprint sensor. We also expect that the Lenovo Z6 Pro will also be equipped with Snapdragon 855 SoC and Qualcomm’s X50 G5 modem for the 5G support. The phone is also expected to feature wireless charging.